When people look for a new house real estate agents show lots of pictures and try to sell them on how special this property is when in reality it could be really just horrible and the not right fit for us. The pictures can really make or break a deal. Real estate agents get to see their fair share of houses throughout their day and some of them can get a little wacky, but hey they’ve got to sell them somehow. Here are some pretty hilarious photos that real estate agents have shared about houses that they have put on the market. Is this how people really want to try and sell their houses? Whether it is toilets in the loving room or broken appliances if they think this is how to sell a house it seems they may have a bit of a hard time selling it but at least we can get a good laugh about it now. Photos that appear in this article are credited to Terrible Real Estate Photos and Penguin Random House UK – visit their site here. A house with a pool. Well, you call that a pool? There’s not much more that screams luxury buy than that, right? Although many of us dream about taking a dip in the water after a long day in the summer sun, it looks as though this home’s yard comes as a bit of a fixer-upper. It appears the owner wasn’t a fan of swimming and didn’t want to waste their precious money keeping on top of the maintenance. Sadly, it looks like their money-saving habits might soon come back around to bite them now it’s time to sell the house. Maybe this estate agent needs to find a new owner with a collection of amphibians to buy this property? Sometimes, estate agents have to work hard to make sure they get the best view of the room. After all, taking the shot from above could soon make the room feel a lot bigger than ever before. So what about when the room is filled with all kinds of weird and wonderful things? Not everyone opts to hang their clothes in the middle of the room, but this snap could be about to start a new trend. However, it’s hard to ignore the elephant in the room, or should we say pig? Yes, it appears these owners are closer to their farmyard animals than most of us. So close, in fact, they are willing to let their pig curl up and have a sleep on the couch. Any potential new owners might want to make sure they have plenty of air freshener to hand – or have no sense of smell. It comes to something when real estate agents have to list that homes definitely aren’t haunted. However, no matter how many times these sellers state their home is ghost free, photos don’t lie. It might be no surprise that the owners of this house want to sell up and move on – especially if the rest of the property is as creepy as this. Many of us love horror films, and if they’ve taught us anything, then it’s to avoid houses like this at all cost. Although the room might be perfect for anyone trying to avoid natural sunlight, it might not be the ideal choice for anyone hoping to make it through the night without getting disturbed by a spirit or two. Perhaps it might be best to invite Amy Bruni and Adam Berry along for anyone brave enough to step foot in this house? Out of sight, out of mind, right? Well, that might not always be the case. There could be so many reasons someone is hiding behind the door. The man could be trying to prank the photographer by jumping out and scaring them. He could be trying to stay out of the shot without realizing he’s now the star of the photo. He could be the person who’s been sleeping in the house while it’s up for sale and has just been rumbled. It looks as though we’ll never have our answer. There are some movies that have gone down in history as some of the most memorable ever made. The horror The Exorcist is one of the few. Many of us remember those bone-chilling scenes, and it looks as though they affected some of us more than others. This owner didn’t want to take any risks with anyone staying at their house. Instead, they built the perfect addition to the bed to make sure that no one could ever terrorize their home overnight. Of course, all of those home renovation shows have left many of us wanting to take on a project or two along the way. How hard can it be? If we’re really brave, then we could even head to an auction and buy the home without ever setting foot inside. That plan might not be at the top of everyone’s list after seeing a house like this. There are fixer-uppers, and then there are homes that need to be burned to the ground before the mold takes over the neighborhood. Owning our own home can be the perfect way to let our personalities shine through. This is just a guess, but we think the owner might have been a fan of Marilyn Monroe. We’re not sure what the first clue was – we just have a hunch. As if plastering the star’s face across every surface possible wasn’t enough, this person has gone one step further to make sure their home is the most colorful on the block, and potentially the whole world, with their psychedelic color scheme. Have you ever found yourself doing a shuffle up the stairs as you try to make it to the bathroom before it’s too late? Maybe you fancy a sit down to catch your breath while climbing the stairs and suddenly realize that you gotta go? Whatever the case, it looks as though this home has been designed with all those thoughts and more in mind. Not only is there a toilet halfway up the stairs, but someone has gone to the effort of plumbing in a sink to take care of all of your bathroom needs, too. 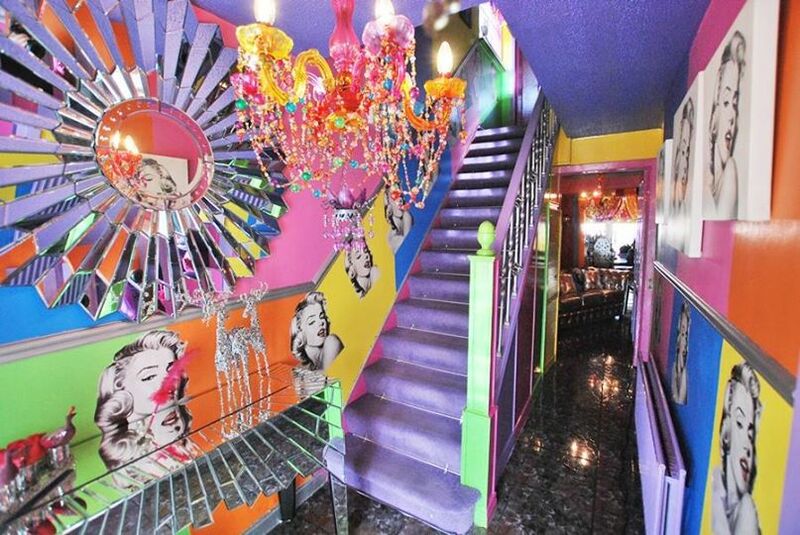 Hopefully, this house is designed for one owner. After all, it might be tough to find some private time on these stairs if there is s a home full of people trying to go about their days while you’re hoping to get yours off to a good start. Some houses can feel like a maze. However, it appears as though the person behind this build wanted their sense of adventure to come to life in a whole new way and took some inspiration from the horror movie, Get Out. Or maybe these are portals to another world and this is a major deal. A magical house of sorts. You never know when you might need to get lost in your own home, but thankfully, someone could be about to get a lot more practice than they ever believed. Where would be the fun in them all being on the same level? This way someone gets a workout at the same time. Perfect. Some of us can spend hours in the bathroom. Getting our hair done, putting on our makeup, and adding any other finishing touches can take plenty of time. No longer do we have to worry about getting bored or lonely. No, this owner appears to have thought of it all thanks to a small addition for those couples that just can’t get enough of one another. The best bit? The addition of the pet bowl makes it look as though the whole family can get involved in this bathroom. This rooms is all in one, a bathroom, a living room, a place for the dog to eat, a storage room. Wow. Many of us love to find ways to enjoy our outdoor space. However, not everyone is lucky enough to have a home with a porch. What is there to do? Break out the tools and craft your own, of course. Thankfully, money no longer has to be an issue. Is this fridge actually holding up the entire house? All you need is a little spare wood, some nails, and a refrigerator to bring your dreams to life. Yes, that’s right; a refrigerator really can be the answer to all your issues. Now, a cold drink will never be too far away while soaking up some sun. It can be tough to know what the previous owners got up to in our homes before we move in. That is until we find a clue or two along the way that might give us more of an idea of the lives they lived. Sadly, this might not be the symbol we all want to find. It appears as though the owners were up to a little witchcraft in this room if the crescent moon and star are anything to go by. Hopefully, they were hoping to bring joy and happiness – not leave any unwanted demons. Sometimes, it can feel as though summer gets so hot that the entire house is going to melt. That might not be too far from the truth for these owners. Whoever would have thought the heat would be able to wilt an entire ceiling fan? A house with aircon can be a huge bonus for anyone moving into a hot neighborhood. However, it might be best to leave this one switched off for the time being, unless dodging flying blades is a popular hobby in your family. Have you ever found yourself wondering what you might look like from all those different angels? While we might have days where our hair is playing ball and our outfit looks good, we’re not sure that we’d want to see the look from every aspect of the room. That might not be so much of a choice in this bathroom thanks to the previous owner’s love of mirrors. It might be time to stock up on glass cleaner for anyone wanting to keep their new bathroom looking fresh at all times. A house with a theme. These can be the best and the hardest houses of real estate agents to sell. After all, they usually have to find a pretty niche market that is into the same thing as the previous tenant if they stand a chance of selling the home. This person appears to have a love of the 1800s where everything seems a lot simpler than the modern day. The best bit? If you look closely, you might spot the characters prepared to wait on you hand and foot while you sit back and relax. A little greenery can be the perfect way to bring life into the home. Sure, small rooms might have looked like they needed a little something extra, but a pot plant or two can soon be all it needs to make the space feel more alive than ever. So what about when the owner wants to take their love of gardening one step further? Although the decor all sticks to the theme, that doesn’t always mean a recipe for a winning sell. If you’ve ever found yourself sat on the toilet and wished there was a way that your dearly beloved could join you then look no further. This room takes the meaning of family bathroom to a whole new level. We’re not sure this is what the real estate agent had in mind when they read two toilets, but it certainly doesn’t lie. Hopefully, there’s someone out there who wants to be just as close to the rest of their family while doing their business. You never know. There are so many questions with this room. Why is there a black border around the outside of the floor? Why have they put so much effort into painting the walls? Why is the window covered over? However, there is one that is burning more than the others. What did someone do to deserve a spot looking at the blank wall? Perhaps they didn’t agree with the color scheme or were putting up a protest about moving? Whatever the case, it doesn’t look as though someone was allowed to be a part of the family. Chores. These are the thing that can dominate our lives if we don’t keep on top of them. Laundry is one of the biggest jobs that many of us have to undertake. Why do the clothes never seem to end? It looks as though this owner has a solution. Rather than wasting their time washing and folding all those clothes, all they need to do is put their house up for sale. Now, clothing mountain can be someone else’s problem as they find space for a whole new wardrobe in a new home. There is something about dolls that has many of us running for the hills. It could be too many watches of the horrors Child’s Play or Saw, or it could be the eyes that always seem to hold your gaze – no matter where they are in the room. While we might never know the answer, it looks as though this owner has been able to combat their fear. That or they left the previous owner’s collection until someone else bought the house and had to deal with it themselves. Modern builds can be all about making the most of the space and creating areas in homes that we’ve never seen before. Unfortunately, there is typically a good reason that these designs have never been put into practice. This bathroom is perfect for all those emergency drives home when you make it to the bathroom with just seconds to spare. However, that’s where the pros seem to end, and the cons begin. Who needs privacy anyway when you could enjoy a bathroom with a view? This could be the house of dreams for many real estate agents. Large windows to let in lots of light? Check. A spacious room to fit all that new furniture? Check. A fireplace? Check. That is until they get to the floor. Ok, drag marks leading to the doorway might not be the biggest selling point of a house, but sometimes you have to work with what you’ve got. If all else fails, then we’re sure there’s a Netflix documentary to be made somewhere in this home. Some real estate agents have learned how to find the best in properties and use them as the selling points for the homes. A pool can be a great asset to many houses. However, it might be important to mention it’s ready to go before trying to take photos. It appears as though someone was having a good time before the real estate agent arrived to snap the home, but they forgot to remove the evidence of all those parties before it was too late. We can’t help but wonder who this person got hold of so much matching material, yet here you have it. Floral print was once one of the latest trends to sweep through houses everywhere. However, these owners apparently wanted to be more on trend than ever. Why stop at the bedspread when you could decorate your room floor to ceiling in the stuff instead? They say you can never have too much of a good thing. They probably never saw this room. Some of us like to make sure that we have everything covered in case of an emergency. Others? They go above and beyond in the hopes of ensuring they are always protected. The owners of this house appear to have a strong fire safety plan judging by the number of extinguishers they have collected over the years. Sure, some homes come fitted with sunrooms, annexes, or home theaters. So what about a fire extinguisher room? This is the addition that many of us never knew we needed – until now. Although it might have been a better idea to spread them out throughout the house to ensure that you’re covered in every room, but at least someone will be nice and safe in this room, right? We just hope they come as part of the buy to help the next owners feel as safe as the previous tenants. There are some items that just seem to collect over the years. They’re usually random mugs, clothes hangers, or towels. It appears as though becoming an adult gives us a lifetime subscription we never knew we signed up to. So what about when your subscription seems to be for chairs? It looks as though this owner has spent many years growing their collection and now there is nothing left to do but pile them high and hope no one needs to pull up a seat. It appears as though someone had many ideas about what they wanted to do with this space. Why decide on just one when you could do them all instead? Part of the back of the room looks as though it was destined to be a kitchen. However, the main space has suddenly found itself transformed into a chat room set. While not all of us want to start a television studio from our homes, these owners must have had big dreams and were willing to do anything to fill them. Many of us have some useless home gym equipment lying around the house. The chances are we bought them with every intention to get our lives in order and shape up. However, it might not be long before they turn into a clothes rail. Rather than letting their equipment take up vital space in their home, it appears this owner has moved their stationary bike and treadmill out onto the porch and is now using them as a plant pot stand instead. It was apparently a photo opportunity not to be missed for this real estate agent. Sometimes, there can be a deal that is just too good to miss. Sure, we don’t need all those bottles of mustard or the extra set of tires for the truck, but the offer could be a once in a lifetime deal. It appears this owner might have seen a deal on this shower they just couldn’t refuse. Rather than make space for the huge addition in their bathroom, they opted to turn the corner of their living room into an extension of the room instead. Studio apartments can see many of us living in tiny spaces and making the most of the room we have on offer. Rather than waste space with a useless bathroom wall, the person behind this home opted to blend all the rooms into one. It’s the ultimate space-saving idea, but that’s not all. Now, anyone living in this home can be cooking up a meal on the stove while taking care of their bathroom needs at the same time. Does it get any better than that? We thought not. Many of us look for homes with parking spots. The city can make it tough to find a place to park our car, but thankfully, this house comes with all the space we could need to keep our vehicles safe. Worried about thieves breaking into your car? Have no fear; this house could be the place for you. Just make sure you have a small car if you want to fit it through the doors. However, you could soon keep a close watch on your car to make sure that it’s safe – literally. Sometimes, we have to look a little closer to see the beauty in houses that might not be so obvious at first glance. This home looks as though it’s been jiggled around to ensure there are enough bathrooms for everyone. However, that might come at a cost. Sure, they could have opted for a solid wall or separate room for their bathroom, but why bother when you could use a perfectly good shower curtain instead? Occasionally, we all need to save a little money here and there. Some of us will do anything to bring our favorite TV shows and movie to life. It looks as though this owner found the perfect way to pay respect to the crime drama Breaking Bad. after all, the show became an instant hit and looks as though it’s made an impact set to last a lifetime. What better way to add your spin on the series than by injecting a little comedy? Sometimes, all it takes are some oversized narcotics and a welcome sign to make the place feel like home for Walter White. There are some rooms that have many of us wondering what anyone was thinking when they brought their designs to life. Black and white tiles teamed with bright green and red walls might not be everyone’s first choice, but it looks as though it was the perfect color scheme for this bedroom. However, it can be tough to ignore the shark weapon on the wall. We just wonder what the post-it notes say? Probably a reminder to take down the unusual addition before the real estate agent arrives to take photos. Some of the best conversations happen between just us and our best friend. It appears that’s a lesson this person has learned over the years, and one they want to keep alive. So how do you make sure you’re not disturbed? All you need to do is find two plastic chairs and set them up in one of the most uninviting areas of the home. It looks as though the real estate agent wasn’t left with much to work with, but they did everything they could to make the snaps look as appealing as possible.